I have met several great Amazon sellers but Francina is one of the nicest and best sellers I have met. Her products were first sold here and are still sold on Amazon now she has her own great website here. We found so many things Sierra loves! We were able to try several different items this time from Smit Co LLC. We enjoyed them just as much if not more than the products we tried at Christmas check out that post here most of those items are still available also. 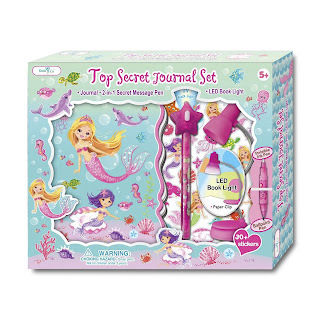 This time we tried the Secret Diary For Girls Mermaid theme, Nail Art Set, Scratch and Sniff Nail Art and the Scented Secret Scrapbook,. 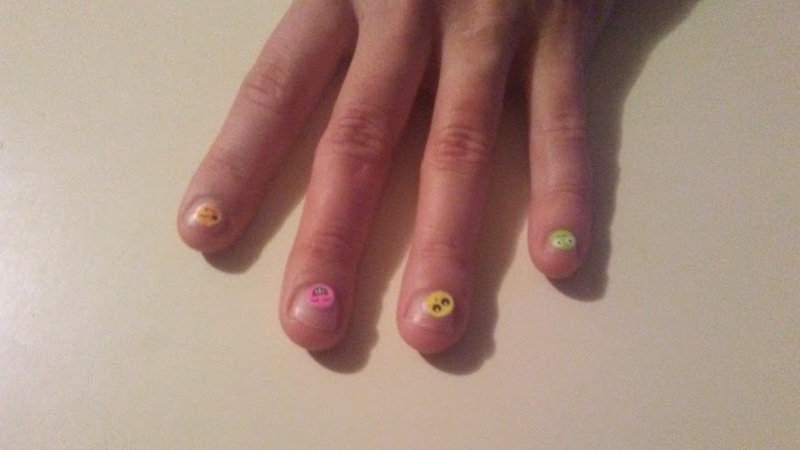 The Secret Diary for Girls Mermaid theme is a lot like the Secret Diary For Girls Emoji Theme we reviewed previously except the Emoji theme I think is great for boys or girls that's why I mentioned it. If you are buying for a boy check out the Emoji theme. 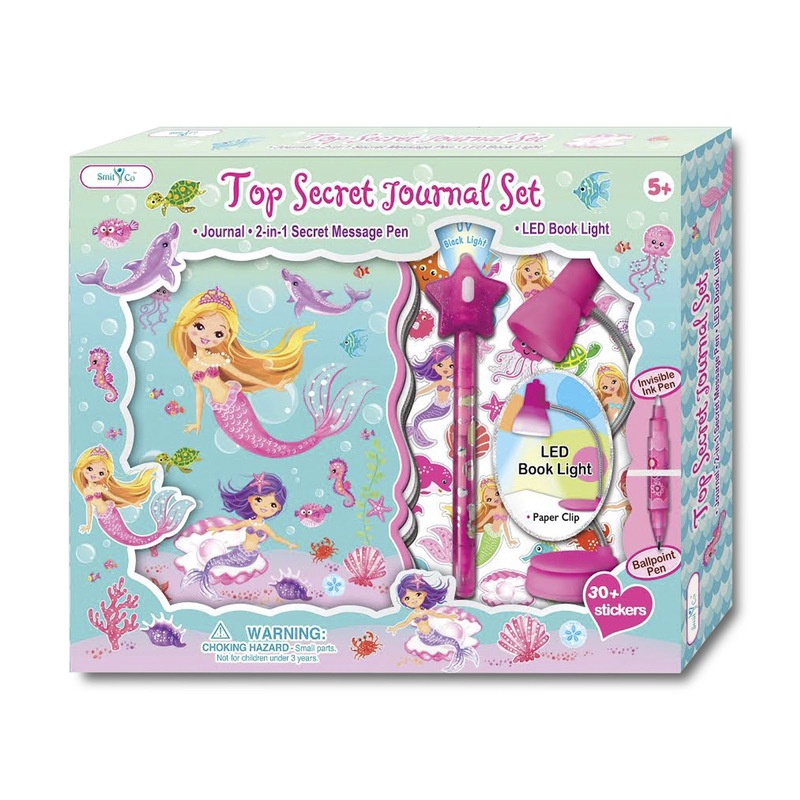 The set includes invisible ink pen, led desk lamp light and locking diary. The led desk lamp is also so cute, it is child size and can easily be moved and placed right on top of your diary whenever you write. The invisible pen gives that bit of elusive quality, kids think they are hiding their messages. Mine loved that! The Nail Art Set is two sets actually! Either set would be great on their own but Smit Co LLC brings you both sets for what you would pay for one. The Sweet Crush set includes glow in the dark nail patches and top coat. It has both finger and toe nail stickers, nail file and nail stick. The Sparkling Set also includes top coat for sealing stickers and a nice finish as well as animal print stickers. nail file and nail stick. In total you get 163 stickers with both kits. They are easy to apply and to take off making them perfect for little ones. These would be perfect basket stuffers for a little girls Easter Basket! 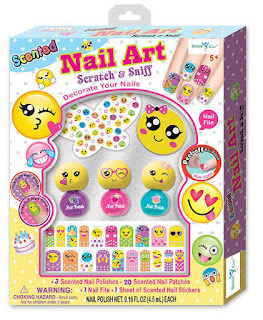 The Scratch and Sniff Nail Art kit I would have to say is my favorite I actually did this one with Sierra and did mine and her nails. You get three scented polishes in Purple Grape Scent, Pink Strawberry Scent and Blue Cupcake Scent. I love the scented stuff and really enjoyed fixing mine and Sierr's nails with this kit. I loved that the polish is great for kids and actually peels off of everything rather than sticking and staining. A nail file and nail stick is also included in this set along with several stickers and decorative gems. This would be a perfect Easter basket stuffer for little ones up to the tween age! Last but not least the Scented Secret Scrapbook is another great Easter gift. . I loved the scented stickers. The kids and I really enjoyed all the scented goodies we got to try from Smit Co this time. I am an eighties baby so scented toys bring back great childhood memories for me and I love sharing that with my kids. The scented stickers are great for decorating your scrap book. You also get a really neat fuzzy pen and sticker jewels. The little pouch included is great for putting all of your diaries accessories in. The diary also included a secret combination for locking. It is my favorite diary Smit Co has right now.